18 inputs & 20 outputs with 8 natural-sounding combination input mic preamps, roundtrip latency of 2.74ms*. No words can explain how satisfied I am!!! But I will try... the best, easy to install, the best sounding, quietest, unit I have worked with!!! Beautiful in every aspect!!! Robust build, clean preamps, virtually zero latency. It is solidly built, sounds great and gives incredible options for my studio pro tools rig. Works perfectly, great sound, easy to install. Excellent. Plug and play ! Great product. Works like a charm right out of the box. Loved that it came with pro tools first and a bunch of plug ins. Happy to add this to my home studio!! When I received my focusrite, I had 2 choices of AC plug, one for France and one for England. You sell in america, we have to consider that we are on the 120 volts and not on the 220 volts. Exactly as described. Great interface for the price, and loaded with features. With a good balance of easy to reach front panel controls and a flexible software interface, this is a nice bit of kit to use. This audio interface is the clear example of innovation and quality that makes Focusrite the enterprise it is. Fall in love with the product. A great sounding interface, very quiet noise floor, lots of headroom and fast latency with USB 3. Very pleased I upgraded! The second generation Scarlett range is packed full of upgrades. The lowest roundtrip latency in its class (2.74ms*) brings confidence to your performance, letting you record and monitor with software effects in real time. New metal gain controls and a sleeker red metal chassis reassure you of its improved industrial design, built to go anywhere. 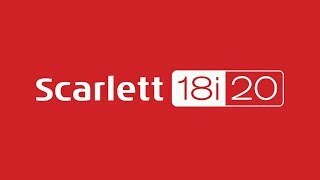 The Scarlett range also now operates at sample rates all the way up to 192kHz, and the input channels have evolved too. The latest Scarlett mic preamp features a more even gain structure, so you can accurately set your levels, and the instrument input has also been completely redesigned with increased headroom to handle seriously hot guitar pick-ups. Finally, Focusrite have provided analogue protection circuitry across both the inputs and the outputs, guarding your interface against unwanted power surges. The included 'Focusrite Control' is a brand new software mixer for easy configuration of monitoring and routing setups. Simple and intuitive to use, Focusrite Control offers a traditional mixer workflow and allows immediate access to internal hardware functions. Also included are the software and effects you need; an exclusive version of Pro Tools | First - Focusrite Creative Pack (featuring 12 additional plug-ins including the Eleven Lite for real life guitar amp emulations), Ableton Live Lite, the Softube Time and Tone Bundle, Focusrite's Red Plug-In Suite, 2GB of Loopmasters samples and more. Multichannel mic pre expansion with eight 2nd generation Scarlett mic preamps with up to 192 kHz sample rate.